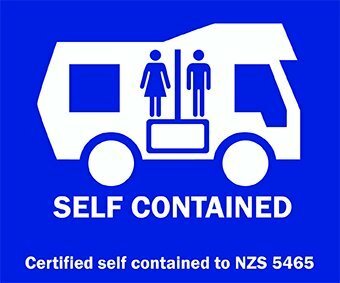 If you’re travelling New Zealand by campervan and would like to stay on campsites you need to clarify whether your vehicle is “self-contained” or not. Some campsites – especially those reserved for Freedom Camping – you are only allowed to use with a certified self-contained motorvehicle. Violations will result in massive fines that will definitely hurt your travel budget. Chilli Rentals explains which vehicles are self-contained and how to get the proper certification. Self-contained vehicles – what does that mean? Furthermore, the vehicle needs to be able to supply and store enough fresh and waste water for at least three days before needing to externally discharge waste at a dump station. There are also additional requirements for the toilet in regards to size and capacity. Self-contained – who makes the decision? Once thoroughly checked by a certified inspector you will receive your certificate of self-containment. Certification can be obtained from the New Zealand Motor Caravan Association (NZMCA) if you are a member, otherwise registered plumbers as well as certain agencies are allowed to hand out certificates. The blue sticker will verify that your vehicle only poses a minimum risk to the environment as well as to your health and that of others. Please allow up to five working days from the date of inspection for your certificate to arrive in the mail. It will be valid for four years before the vehicle needs to undergo another inspection. However, you will have to get a re-inspection prior to that whenever you modify your vehicle in any way. Self-contained – what are the advantages? Having a self-contained campervan will save you lots of money when looking for places to park up overnight. Freedom Camping has been restricted throughout New Zealand over the past few years by local authorities due to tourists polluting the environment by dumping rubbish and human waste in car parks, scenic reserves and along beaches. The website of the New Zealand Government provides further information.